The diagram above, a chart or body graph from the Human Design system, is a depiction of the "suchness" or essential expression of a particular individual (in this case, myself). By suchness we mean what is consistent about a particular person throughout their lifetime, how energy expresses itself through them and how they connect to everything and everyone one else in the great chain of being. 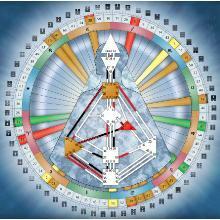 The body graph has nine centers or chakras. The centers that are "colored in" (in my case six) are defined, or yang or expressive; creatively active throughout ones lifetime, with each having particular archetypal expressions (such as the fuel to struggle for meaning or the intuitive ability to risk). The centers that are "white" or not colored in are undefined, or yin or receptive; they are where we take in the world, where energy flows through us, but also where we become deeply conditioned, attracted to and attached to what we are not. Human Design "samples" our existence twice: the first at the exact time of birth, as in astrology, and the other eighty-eight days before birth. The first chart - the column in black on the right is called Personality, the part of ourselves we are conscious of, the person we think we are and with whom we identity. The column in red on the left is called Design and is our unconscious, what goes on below consciousness (just as the functioning of our kidneys and circulatory system does). This column represent genetic inheritance from our mother, father and grandparents. The Design is how we are genetically programed to move through time and space, the Personality who we think we are. The interaction between the two is a quantum, a dynamic and complex "mystical union." Where we are defined is our life force; literally our chi, lungta or prana. We align with definition we are synchronized in body and mind, genuine in who we are and how we contribute. When we identify with our conditioned experience, what occurs in our open centers, we become confused, ingenuine and pinned within constructs of obligation, expectation and resentment. To release our acquired conditioning and become individuated and firm in our suchness is, one could say, the spiritual or spiritual-warrior's path - or simply a path of becoming fully human. As we step onto this path, life presents us with tools, opportunities and teachers; for me, the Human Design system has been rich in all three and of great value. These are the nine centers of Human Design. The channels that connect the centers to each other are each part of several circuits, such as the collective or shared circuits of abstract experience and logical understanding, the tribal circuit of mutual support between individuals, families and groups, and the individual circuit, the knowing unique to each person, with its potential to bring evolutionary mutation to the collective and tribal aspects of humanity. 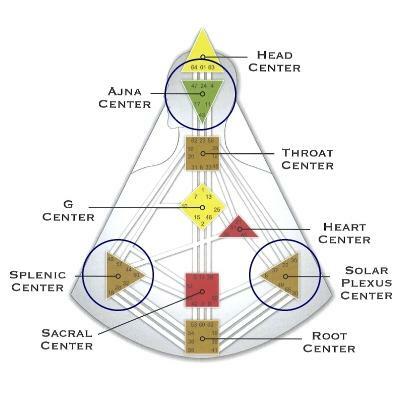 Of the nine centers in the body graph, three are "awareness centers." The Ajna Center is our mental, conceptualizing awareness and it occurs "over time," that is, we can hold to a certain thought, idea or opinion - for better or worse - over time, even over our lifetime. The Solar Plexus Center is emotional or spirit awareness and occurs in a wave, literally the energy wave of any given emotion. An experience of melancholy, anger, desire or emotional enthusiasm will have a crest and a trough, the duration of the wave of energy the emotion produces. The Splenic Center, connected to our immune system, is body awareness, the experience of taste, intuition and instinct, that always and only occurs in the now. This column still in development. Where we are "defined" is where we are consistent. Definition is the expression of who we are. 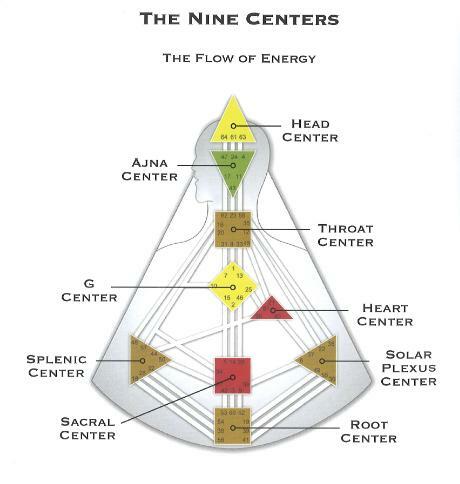 There is a flow of energy between our defined centers. This flow of energy continues throughout our life, just as we will remain, say, right handed, of hispanic ethnicity, with type O blood. We can “rely” on our definition since there is no one else we can ever be. This is our unique expression, the foundation of all our relationships, the source of the mystery of who we are, the expression of our suchness. Actually living from our definition is extremely challenging and to do so is a psychological and spiritual accomplishment, a semblance of what C.G. Jung called individuation or what Buddhism might call basic sanity. We are deeply conditioned to not simply allow ourselves to be who we are, but to try to become someone else. Our undefined centers are “who we are not.” Undefined centers are where we are open, where we take in the world. Without our undefined centers, we would have no relationships, no communication, no growth. Because undefined centers are not colored in on the chart, they can appear weak, disfunctional or "broken." This is hardly the case. We are open to a broader range of experience in our undefined centers. We are drawn to these centers, we go “to school” there, and we potentially become wise there. If we are entirely undefined emotionally, for instance, we are an open window and can experience all types of emotions. But ff we try to hold on in any way to the emotional experience, or expect it to return in some consistent way, we experience suffering and confusion. Because there is no definition here, there is no reliable energy pattern; no ground, nothing consistent, nothing to hold on to. Conditioning originates from our undefined centers, but requires a “story-line” to really take hold. Our story lines tend to have the word “should” in them. They function as internalized rules, dogmas and advertising slogans. They interpret everything we do and and tell us we must change ourselves or get something outside ourselves. We should become this type of person or get this type of car. Our story lines fuel a life of hope and fear. But they work most effectively if we always stay busy. There is an equation that runs us destructively: Internalized story-lines + speed = conditioned life experience. To be conditioned means to have no idea who we are and what our potential is. It is to suffer. 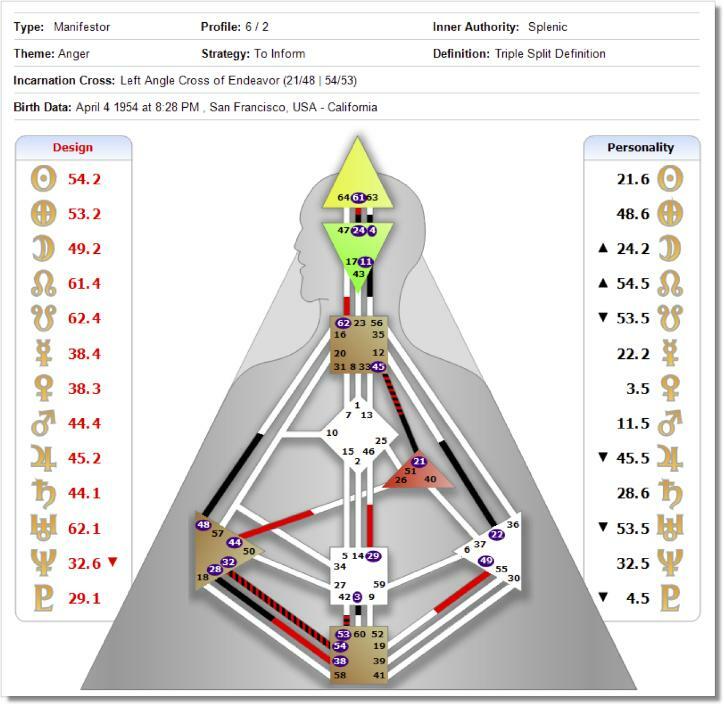 Human Design integrates several ancient, symbolic sciences: the I Ching, Western astrology, the Hindu chakra system, and the tree of life from the Kabbalah of esoteric Judaism. Human Design, like these other so-called “esoteric” system, is an intuitive science. One cannot necessarily prove why it works, but it clearly is a science in that its map or chart makes tremendous sense to most people. Experience validates its accuracy. Applying its methods leads to growth, and astonishing breakthroughs of self-acceptance and actualization. The Human Design chart is also a great aid in the day-to-day decision making we are all faced with. We may have been interested in our world when we were little children, but then we were taught how to handle it by our parents who had already developed a system to deal with the world and to shield themselves from it at the same time. As we accepted that system, we lost contact with the freshness and curiosity of experience. - Chögyam Trungpa. For many years I used the quote above as a teaching device in my meditation class at Naropa University. For me, it contrasted our numbness and other adults dilemas to where they should be contrasted, to the oceanic mind of wonder we once inhabited infants and children, a time when we were more engaged in being than occupied with doing. The quote conveyed the force and truth of poetry and satisfied the part of me that is a poet. When I first encountered Human Design it seemed anything but poetic, transmitted visually through a body graph that looked complex and mechanical. At the same time, I couldn't take my eyes of the chart - nor stop listening to the recording of the reading I received in 1995 by the founder of the system, Ra Uru Hu (at one time Robert Alan Kracowitz). In fact, one could say the body-graph is the science of poetry, a system of fascinating logic and tremendous depth that maps the energy or suchness of our own unique expression. Good poetry is expressed through precise and luminous details; the Human Design body-graph and the information it represents is similarly precise and illuminating. I've continued to study Human Design for these subsequent seventeen years. Ra Uru Hu died last year and I miss him. I have ever growing admiration for what he accomplished. Human Design, a synthesis of Western astrology, the I Ching, the Hindu chakra system and the Kabala's tree of life was transmitted or channeled into him by what Ra called "the voice" during an eight-day period 1987, while he was living on the Island of Ibiza. Conventionally speakig, Ra's story is not necessarily any more dubious, unbelievable or far-fetched than that of Ibn Arabi, who wrote at least four-hundred books and encountered and was led by "ascended masters" throughout his life; of William Blake who archetypally opened to and shouldered the task of reinventing Christianity through art and poetry; of Rilke, who wrote his masterpieces, the Elegies and Sonnets, over a single three-week period, or of Chogyam Trungpa (and other's of his tradition), a terton who brought hidden-teachings into our age, among his many other accomplishments. Each of these figures had access to and was working with, or worked by, multiple dimensions.